The central message with putting is that you should keep things simple while focusing on your target at all times. It is a mindset that is decisive and one that gets the job done with the minimum of toing and froing. Most golfers generally take too long over their putts thus contributing to slow rounds. The longer your pre-putt routine is before you pull the trigger, the more likely you are to get in your own way. After many years of watching golfers putt I believe that those who go about their putting in a minimalist manner are more consistent putters. They decide without fuss where they want to aim, step in, take one focused look at their target and then complete their stroke. On the other hand there are those who appear never to be able to make up their mind. They examine each putt from every angle, losing sight of their target in the process, and eventually putt to the relief of their playing partners. On the professional tours you will see many different approaches to putting from quick to agonisingly slow. I am yet to be convinced that the slow putters benefit from their painstaking pre-putt routine with numerous practice strokes and sightings of their target. In simple putting you can get most of your information gathering approaching the green and while others are putting. When it is your turn, you are pretty much ready to go. You may take a few rehearsal strokes from behind the ball while looking at your target. This is mainly to fine-tune your feel for the putt as well as release any tension in your arms. When you step in you are focused on your target. (Remember that while the hole is your ultimate target, it is not necessarily your aiming target). One technique is to set up to the ball, focus momentarily on the hole and then slowly draw back your eyes to the ball along the path that you have visualised. Then putt along this path with the image fresh in your mind. I can never understand why golfers in their pre-putt routine appear to be calculating the size of their stroke with a series of practice strokes while looking down at the ball. At least look at the target. In any case it is a bad idea to try and calculate consciously the size of your stroke. Your brain does a better job subconsciously provided you feed it the right information about your target. "Miss 'em quick" is a myth. The longer you dwell over your putt, the more time you allow for doubt and tension to creep in. 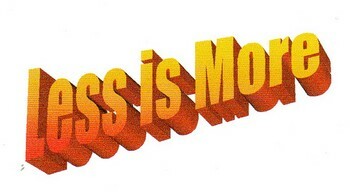 Slowness doesn't equate to better putting. 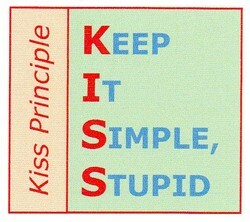 Use the Kiss Principle instead. In a nutshell you can't putt well analytically. Your stroke should be free of thought with your mind totally engaged with your target. Trying to be perfect is a recipe for failure. Simple Putting helps you to putt more by feel, the way you would toss a ball to someone nearby. The 'Look and Shoot' approach advocated by Dr Bob Rotella.